Today was Ashram Sadhana day, a day where all the monks come together to clean and tidy up the Aadheenam. A few monks did some fence repair for our cows pasture, and the whole herd came over to say hello. This entry was posted on Wednesday, April 17, 2019 at 9:02 am and is filed under Farming, Kauai, Monastery. You can follow any responses to this entry through the RSS 2.0 feed. You can leave a response, or trackback from your own site. The monastery has enjoyed a busy phase, as we ready for the arrival of pilgrims for our 2018 Mahasamadhi celebrations. Also this phase, the Hinduism Today team has been hard at work finalizing the next issue of the magazine. After our retreat Mahasamadhi phase begins with a early morning homa and days of classes and events for pilgrims. See you agian soon! This entry was posted on Tuesday, October 30, 2018 at 5:46 pm and is filed under Kauai. You can follow any responses to this entry through the RSS 2.0 feed. You can leave a response, or trackback from your own site. On Friday, September 28, Sadasivanathaswami and Arumuganathaswami flew off to Honolulu. They were invited by the Governor to attend and bless the signing of a Sister-State Agreement between Goa in India and Hawaii in the USA. The agreement will promote trade, tourism, information technology; and exchange of health and wellness, agriculture, culinary art, education and cultural programs between private sector organizations and universities of both states. It was an important event, insofar as it was Hawaii's first official connection at the highest level with India. A delegation of three flew to Hawaii from Goa for the signing. The swamis were able to do other significant things before and after the mid-morning signing, mostly relating to the monastery's agricultural endeavors and our mission to save a $250,000,000 irrigation system that island farmers depend on, including us. The slideshow tells the tale. Aum Namasivaya! This entry was posted on Sunday, September 30, 2018 at 8:01 pm and is filed under Kauai. You can follow any responses to this entry through the RSS 2.0 feed. You can leave a response, or trackback from your own site. 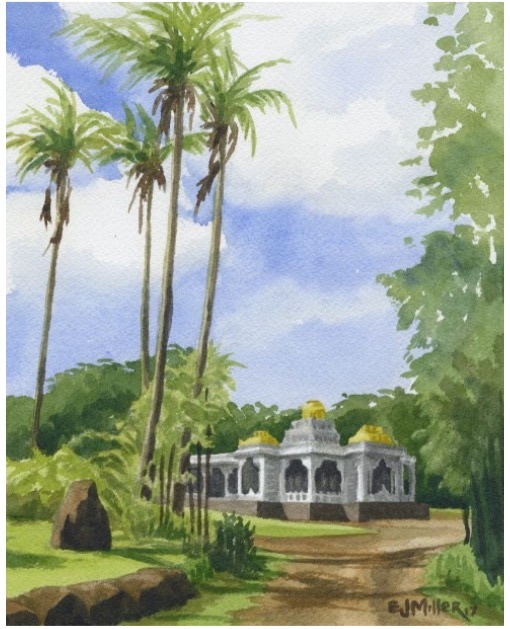 Two Kauai painters are putting out a new book on heiaus, churches, Hongwonjis and our monastery. These two works appear in the new book. This entry was posted on Thursday, September 20, 2018 at 3:32 am and is filed under Kauai. You can follow any responses to this entry through the RSS 2.0 feed. You can leave a response, or trackback from your own site. These giant logs where recently acquired from the nearby Alexander's Nursery, whose owner we have known for 40 years. They were brought up to the monastery and placed near the wood mill. Each is from a massive Earpod tree that fell down five years ago. Instead of rotting, it will now be given a new life as timber. The wood is much like Monkey Pod, being comprised of a swirl of light and dark colors. This entry was posted on Friday, September 14, 2018 at 10:07 pm and is filed under Kauai. You can follow any responses to this entry through the RSS 2.0 feed. You can leave a response, or trackback from your own site. One of our monastics recently captured this shot of our friendly Kauai Cane Spiders. They are rather huge, spanning up to 5 inches across, so its common for people to find them quite scary. However, they are harmless and will likely just run at the sight of you. This male was found in our kitchen. It is actually highly recommended that if you have these in your house, you don't try to remove them. They are beneficial in that they control other insect populations such as cockroaches. Unlike other spiders, they don't weave webs, but rather come out at night to hunt. 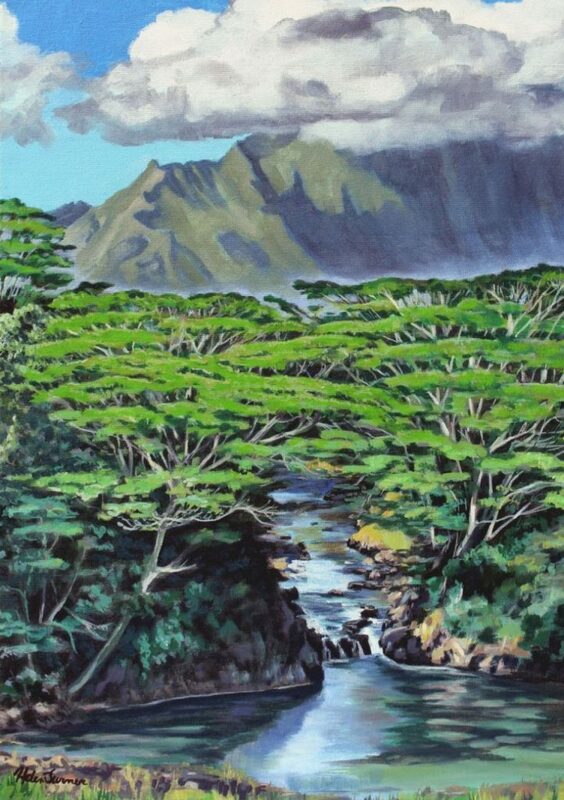 This entry was posted on Thursday, August 30, 2018 at 1:30 pm and is filed under Kauai. You can follow any responses to this entry through the RSS 2.0 feed. You can leave a response, or trackback from your own site.